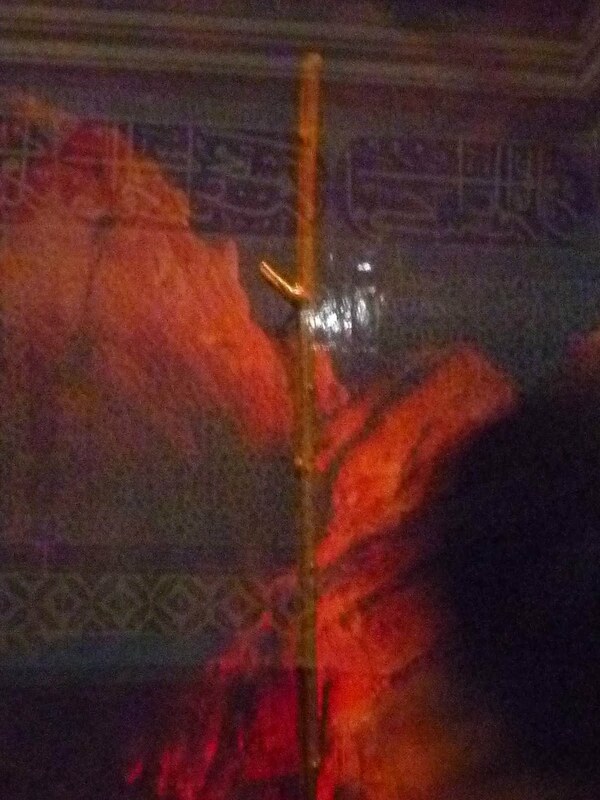 Is this the staff of Moses or the cooking pot of Abraham? Well one aspect of the Topkapi palace I drew a veil over and that was the issue of the sacred relics in the Sacred Safekeeping Rooms. In Ottoman times only the chosen could enter the third court where the rooms are and then only the chosen of the chosen could enter these rooms on special occasions. You know that you are up against it when you find that you aren’t allowed to take photos (and since I didn’t have my phone with me only a large camera I was stuffed – I have “borrowed” these pictures from the Jules and Shell blog which I imagine were taken on a phone). Now anyone can go in it but we are asked to show decorum in this holy of holies and so I went in. The rooms are seemingly filled with sacred relics from seemingly the early islamic period and the old testament period. 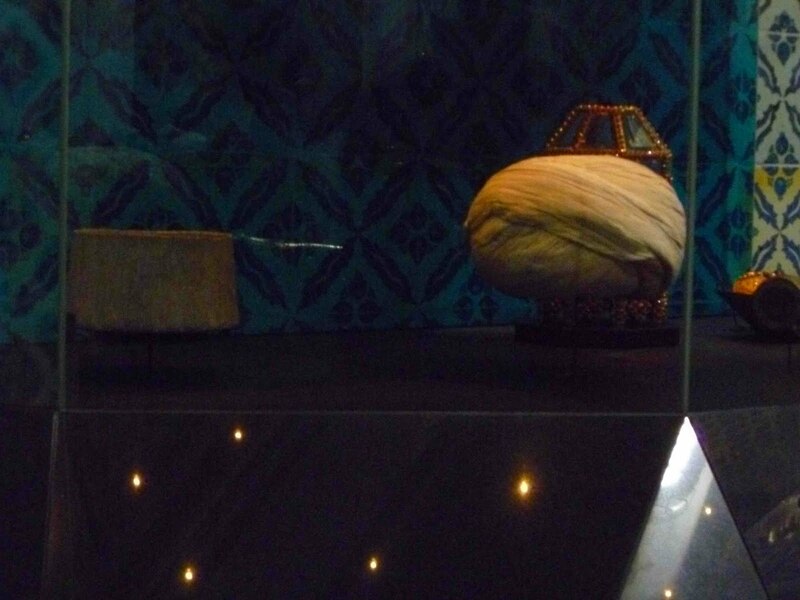 Now, I have no idea about the provenance of the Islamic items – the tooth of Mohammed, several pieces of hair, his cloak, his swords (interesting that last one). I will leave these up to others to discuss their provenance. What I really had to stop myself laughing about were the other items. The staff of Moses – a stick several feet long with a broken off branch towards the top. Then there was the cooking pot of Abraham. I mean who came up with that idea? Did they have a spare pot they found out the back of the store? There was the sword of King David (known as the prophet David in Islam) – remarkable that his sword look so.. well you know.. 16th century Ottoman. I just never had thought that this would be the case. It makes me look at my view of history all over again! Then my favourite – The hat of Joseph – I never realised that ancient Egyptians wore hats that looked like Ottoman turbans – did you? What a major discovery – all those films of ancient Egypt and all those people wearing headgear on Egyptian hieroglyphics? They were obviously wrong – they wore turbans. And because the Topkapi is a museum and the dates for when the museum believes the exhibits to be from correspond to the known dates of these Old Testament characters – then they must be right mustn’t they? I mean there is all that testing that can be done. Checking when things were actually made. The items were gained by the Sultans at the beginning of the 16th century from Egypt which they had just conquered. So in about 1517 they were taken to the Sultan’s palace in Istanbul. Now excuse me – but what??????????????? It is so obvious that these items are just part of the medieval tradition of relics which (relating back to some of my recent posts here and here) re-enforced the sense of Imperial power. What better way of saying that God has backed your rule than by saying that you are the keeper of the sacred relics. As the Ottoman Empire took over the Byzantine one they presumably wanted to legitimise their rule (just as Old Testament usurpers told people they had been told by God to do this). So, are these relics from the Old Testament period? This is number 13 in my series of TQTWTAIN (Theological questions to which the answer is no). These are so obviously relics that were whipped up somewhere and churned out. By the way the last one in this series seems to still be going strong with over 60 comments now! Not always pretty reading but hey! We we there last month and I tend to agree on most of the relics. However, looking into it a bit, it looks as though some of the items from Muhammad may be authentic. You never know I guess. I was there with the family last week and was interested to look up some of these things after leaving there and asking the tour guide, “how in the world would some of those things survive all of these years? who exactly found them and what was their methodology to authenticate, etc”. Of course she could not answer any of that and the exhibits present it as fact. Things like the staff of Moses, Hand of John the Prophet (I assume they mean John the Baptist?) for example and things written down on the side panels, like “The Prophet Abraham and his son Ismail went to Medina or Mecca to visit and thereafter is the reason others started visiting those places (I guess for pilgrimage reasons?)”. None of that made any sense as Abraham would have been alive, what, 1,500 years or so before Mohammed and Islam even came into existence? And, how would they know that was actually a cast of John The Baptists arm? Why would they even care? Anyway, I agree with you that it smelled of a lot of baloney. I was filled with a sense of sorrow and much unease to see how readily the crowds of Muslims were pushing and shoving to get a glimpse of some of these items and obviously were overcome with the moment and I think the reason I decided to share my thoughts with you on this post. Islam started with Adam the first Propet who laid the foundations of the Kabbah at Mecca and Abraham and his son Ishmael rebuilt the Kabbah in their time. You can see the stone that Abraham stood on when building the Kabbah because his footprint is engraved on it and also this stone had the power by Gods leave to grow bigget and smaller depending on which part the of the Kabbah was being built. I couldn’t agree with you more there is a big question mark on that museum, for both relics from Islamic and old testament. Honestly I don’t really care as that won’t make for me any difference, I visited Topkapi out of curiosity only, neither positive or negative impact on my believe would that make. However, am gonna pinpoint one thing really made me laugh about your article, which it shows me that you got all of your knowledge out of scratches, you talked about the hat of Joseph (It’s not a hat nor a Turban) it’s a piece of cloth you put it on your head or neck the way it’s needed, a bet like scarf but it’s not, non the less, on all the pyramids wall shows the Egyptians wearing some kind of the “hats”, but wait a minute,,, Joseph wasn’t Egyptian, was he? So what fashion was his people wear? Don’t try to answer, you don’t know neither I, they didn’t have you tube in their time, BUT they were smarter than us that is a fact, and they will not live in a desert with nothing on their head and neck to protect them unless their horses were convertable with a hard top. Again am not saying it is belong to Joseph or not, but if I were you “God forbid”, I would look for the truth rather than becoming sarcastic and talking non-sense. there are people in the world reading wrong things and believe it without checking it out, don’t be one of those “wrong things”. We r doing exactly what the generations after Abraham did and by the time it was prophet Mohammad time the same Kaaba that was created to worship Only One God became filled with 360 idols ! It wasn’t only me then Will. I was annoyed by people flocking over these so called relics, I’m highly sceptical about their authenticity. A wasted visit for me.